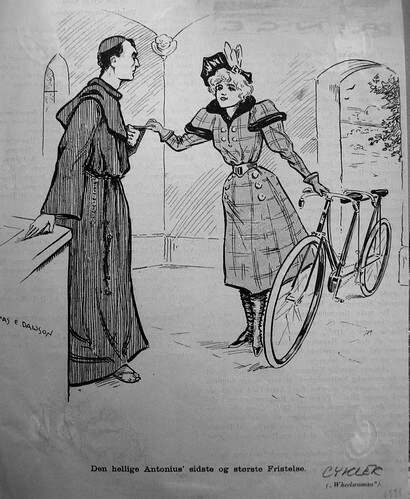 Cartoon from 1892. "The Holy Antonius' Last and Greatest Temptation". The Cycling Girl. Reading a brilliant book from 1947 about the dawn of bicycle culture in Copenhagen and Denmark. Chock full of goodies. Here is an incomplete list of some of the many bicycle clubs active in Copenhagen in and around 1890-1897. There were scores more than these. Loving some of the names.